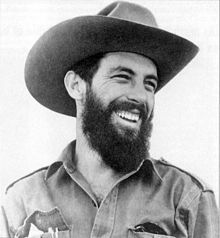 Camilo Cienfuegos Gorriarán (Spanish: [kaˈmilo sjenˈfweɣos ɡorjaˈɾan]; February 6, 1932 – October 28, 1959) was a Cuban revolutionary. He was born in Lawton, Havana. He was raised in an anarchist family that had left Spain before the Spanish Civil War. Cienfuegos became a key figure of the Cuban Revolution, along with Fidel Castro, Che Guevara, Juan Almeida Bosque, and Raúl Castro. On October 28, 1959, Cienfuegos's Cessna 310 ('FAR-53') disappeared over the ocean during a night flight from Camagüey to Havana. He was declared dead on the same day when searches for the plane failed. He was 27 years old. This page was last changed on 20 April 2016, at 12:52.